Brian Wallace, based in California, started Endorfin in 2013. Endorfin formulate each recipe from scratch, using the highest quality cocoa they can find to let the brilliance of each ingredient shine through. They do not roast their cacao beans, in order to deliver the maximum range of flavour and antioxidants possible. Their products unite an old school purist ethos with modern technology and craftsmanship, resulting in a timeless picture of indulgence that is intrinsically sustainable and nourishing to the soul. 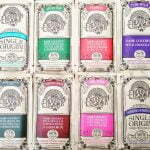 Endorfin strive to make the earth a better place one chocolate bar at a time, by using vegetable-based inks, and compostable or recyclable materials for all packaging.